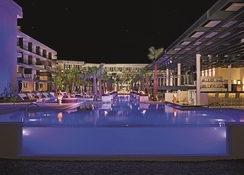 Excellence Riviera Cancun is an adults-only all inclusive resort located close to gorgeous Caribbean beaches on the sunny Riviera Maya. Offering luxurious all-suite accommodations, this resort is housed in brilliant architecture made of stucco, marble and an equal measure of fantasy. Get mesmerizing perspectives of the ocean and sands from the roomy and richly outfitted suites. Come, be spoiled in this fine white-sand resort encompassed by amazing landscape, appreciate the tropical climate and antiquated Mayan ruins, amidst extreme extravagance. Chill out in its six large and lovely pools, relax at its delightful spa or indulge your palate at any of the ten gourmet restaurants. This property has the ability to offer a lavish treat for all your senses. 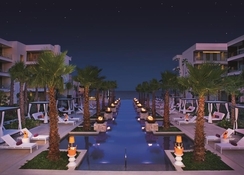 Excellence Riviera Cancun sits on its private beach in Riviera Maya. The Ojo de Agua Beach and Unico Beach club are close to the hotel. There are many fine-dining restaurants close by. The beach is only a few metres from the property. The Cancun International Airport is 23km from the hotel. 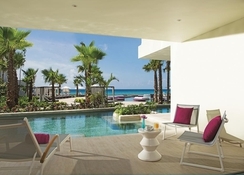 An all-suites resort, Excellence Riviera Cancun brings up nine types of suites furnished with contemporary furniture, amenities and classic Caribbean décor. Most rooms have sea or pool views and feature private balcony or terrace. They come in categories Junior Suite Spa or Pool, Junior Swim-Up Suite, Junior Suite Ocean View and Two-Story Rooftop Terrace Suite. 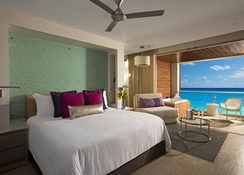 As part of the Excellence Club the hotel offers these suites: Junior Suite Ocean Front, Junior Swim-Up Suite Ocean View, Two-Story Rooftop Terrace Suite Ocean Front, Honeymoon Suite Ocean Front, Honeymoon Suite w/ Rooftop Terrace and Imperial Suite Ocean Front. Guests may be upgraded to the Excellence Club suites. For comfortable living, these rooms come with en-suite bathrooms, hair dryer, a jetted bathtub, in-room safe, a daily turndown service and iron and ironing board. Relish truly global dining at Excellence Riviera Cancun’s 10 international restaurants serving up flavours from around the world. Experience gourmet cuisine at its best—from Asian, Indian, Italian, French, and Mexican dishes. Breakfast buffet accompanied by live music, al fresco lunch by the pool, or romantic terrace dinner, take your pick. 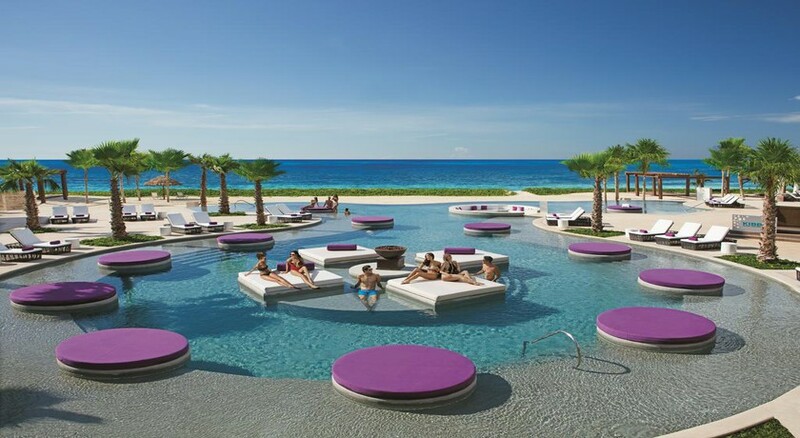 There are magical bars and lounges, including pool and beach bars, serving up premium drinks and cocktails. Even the fully stocked mini bar is included in the all-inclusive service. 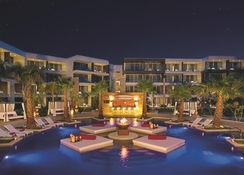 From snorkelling by the coral reefs or swimming with dolphins, exploring ancient Mayan ruins, teeing off at a championship golf course or immerse into a luxurious spa treatment, this resort offers lavish facilities for rest and relaxation of guests. There is a spa and Aqua Wellness circuit (chargeable) which offer rejuvenating massages and hydrotherapy. Special packages for couples and groups are available. Temazcal steam baths, a Mexico traditional therapy to cure and detox is also offered. One Aqua Wellness treament per person per stay.